CBA accountability? Where are the reports to the community? At the August 23 public hearing on the Draft Environmental Impact Statement for the Atlantic Yards project, we heard rhapsodic praise for the Community Benefits Agreement (CBA) that developer Forest City Ratner signed with eight community groups, only a few of which had any track record in the areas which they must contribute. The CBA includes affordable housing pledges and a 35% minority hiring goal in construction jobs--approximately 525 people a year for ten years--among its main features. It also has led to payments to some if not all of the signatories--a departure from the CBA template pioneered in Los Angeles, where signatories agree not to accept money from a developer. But we didn't hear much about what's happened since the CBA was signed on 6/27/05. 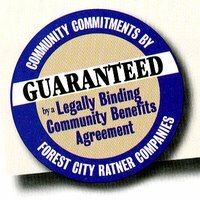 Yes, Forest City Ratner has helped fund signatories to the CBA and has supported a training session for minority contractors, co-sponsored by the New York Association of Minority Contractors, a CBA signatory. The CBA coalition has launched invitation-only Meet & Greet sessions, but there's little evidence of accountability to the broader community. Has the developer funded an Independent Compliance Monitor, as the CBA directs? Not yet, acknowledges CBA spokeswoman Cheryl Duncan. As soon as reasonably practicable after formation of the Executive Committee, the Executive Committee shall publish a Request for Proposals ("RFP") to qualified, independent persons or entities with experience in overseeing compliance with similar arrangements or who have other experience... Such Independent Compliance Monitor ("ICM") shall be selected and hired by the Executive Committee, at an annual payment of up to $100,000 to be paid by the Project Developer, and shall be responsible for oversight of the Project Developer's, Arena Developer's and Coalition members' obligations under this Agreement, investigation of any complaints brought against the Developers or a Coalition member regarding implementation of this Agreement and review of the Developers reports required under Article X (the "Developer Reports"). And what about the environmental challenges posed by the project? After all, the CBA states that, upon execution of the agreement, the Developers will work with FATHC [First Atlantic Terminal Housing Committee] to establish a Committee on Environmental Assurances to address short and long term environmental issues that may affect the Surrounding Community as a result of development of the Arena and the Project. That was in June 2005. Since then, FATHC has been renamed the Brooklyn Endeavor Experience (BEE). Duncan said that a report on the environmental issue was due soon. Note that the "Mitigation Measures" cited in the CBA refer to issues raised in the Draft Environmental Impact Statement, and that CBA signatories must defer to the state. All the CBA does is require that the developers consult with FATHC [now BEE] regarding concerns of the Community regarding environmental impacts caused by the development of the Arena and the Project, including, but not limited to: an on-site and off-site rodent abatement program; a staging plan for construction that minimizes the effects of idling trucks; a pedestrian and vehicular traffic plan; and encouragement of all contractors to use low sulfur diesel in trucks operating at the Project. In addition, the Developers shall adopt prudent environmentally sound building practices that will take into consideration the goal of promoting sustainable development in an energy efficient manner. All potential environmental mitigation measures, the cost to implement such measures, and the party deemed responsible for their compliance is ultimately determined by the State. Therefore, the Developer shall be in compliance with this Agreement by following the state mandated process. The Downtown Brooklyn Advisory and Oversight Committee (“DBAOC”) shall be the community liaison for the Arena and the Project and shall provide periodic status reports to the Community on compliance by the Developers and the Executive Committee with this Agreement. There's no evidence that any status reports have been provided. (2) Developers shall submit the Project Implementation Plan, as approved by Developers and the designated Coalition members, for comment by the Executive Committee within 120 days from the date hereof. Upon presentation and adoption by the Executive Committee, the Project Implementation Plan will become a part of this Agreement and the ICM shall use the Project Implementation Plan as a tool for judging the Developers’ and Coalitions’ progress in achieving the objectives set forth in this Agreement and the Project Implementation Plan. Duncan did not respond to several queries about this plan, the quarterly reports, or the community liaison. In 1992, a group of friends were eager to tackle the combined problems of Brooklyn. Like many other caring Brooklynites they searched for an organization offering flexible, hands-on volunteer opportunities that were not limiting. After careful consideration, they decided to form a new organization, with a new and unique approach: Brooklyn Endeavor Experience, Inc.
Well, if the group was called the First Atlantic Terminal Housing Committee when it signed the CBA in 2005, it certainly wasn't called the Brooklyn Endeavor Experience all those years. Perhaps the name was changed because it seemed narrow to have a fledgling group based on one building--the First Atlantic Terminal Mitchell-Lama tower in Fort Greene--shoulder the "community" task of Atlantic Yards environmental monitoring. Since forming this exciting opportunity, their team members have collaborated to produce a preliminary plan that they believe will energize and strengthen their community, and produce long-term benefits for the entire borough of Brooklyn. We are a team of community volunteers with a proven track record in the Fort Greene/Clinton Hill area. Our team is comprised of members who have worked together on numerous successful projects. Currently, the members are participants in the Atlantic Yards Project and other possible opportunities that can benefit the Brooklyn Community. Our participation is because we want to address not only their interest in the project, but our expectations regarding the project for the good of the Brooklyn Community at large. We have assembled for this project because of our enormous trust and confidence they have with one another. We understand that right now the plan is clearly a “work in progress” which can only be improved by input from the various stakeholders who care the most about the project in question; keeping in mind that the community at large is not overlooked. With this in mind and a focal point of this huge project Forest City Ratner Companies and the community at large can be assured that the lead partners in our group will manage this project closely and carefully, and be accountable with our participation. 10. Sponsorship for community youth and senior existing and newly developed programs in conjunction with the 88th Precinct Community & Youth Council and program and/or office space for the council members and community within the Atlantic Yards Development. Including but not limited to intergenerational programs, etc. Note that Delia Hunley-Adossa, head of BEE and chair of the CBA coalition, is president of the 88th Precinct council, which hints at why item 10 above is more detailed. When I contacted her in June about the CBA Meet-and-Greet sessions, she never responded. Despite the incoherence of BEE's DaDaist mission statement, one thing is clear - they are there to support Forest City Ratner's project. What's at stake: a "sense of place"
Atlantic Yards: Why the rush?